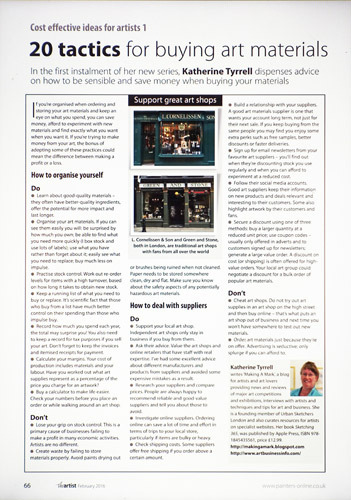 In 2016, The Artist magazine (in the UK) will be publishing a series of ten articles by me on the theme of 'Cost effective ideas for artists". The first one is in the February 2016 edition - published on 31 December - which is now available in the shops or online as a digital edition! It's very easy to find - on page 66 - the last page of the magazine. This series of articles has been a bit of a slow burn and I decided not to say very much about them until the first one was published. I decided to try and adopt a 'workflow' approach to the topics within the series - so it starts with art materials and ends with VAT! Mind you I keep coming up with more ideas for articles so you never know - there might be more! If you’re organised when ordering and storing your art materials and keep an eye on what you spend, you can save money, afford to experiment with new materials and find exactly what you want when you want it! If you are trying to make money from your art, the bonus of adopting some of these practices could mean the difference between making a profit or a loss. They all focus on brief "do and don't" bullet point tips about how to behave in a more cost effective way - or avoid practices which will seriously damage your bottom line! So a quick read - on the last page of the magazine - with a payoff! 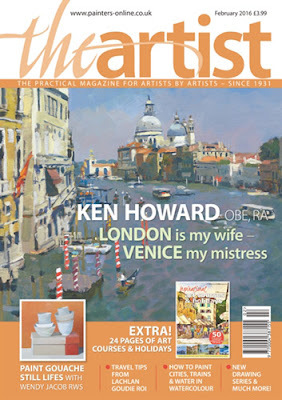 There was a time when you had to wait weeks to get an art magazine posted to you if you lived in another country! However we now have digital magazines which can be accessed via digital magazines. 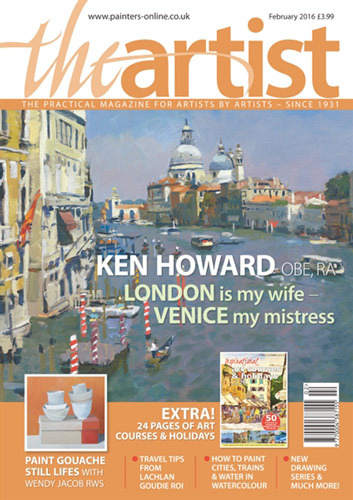 BONUS: This is the edition which also has the 24 page supplement about art courses and holidays in 2016 - always a favourite with very many amateur artists! Can't wait to read them Katherine!